Hot stone massage is a deep massage technique that uses warm oiled basalt and sometimes cold marble stones used as a massage tools and soothing oils, to relax and soothe an aching muscles in the body. The warm stones are placed on multiple acupressure points around the body, and sometimes even tiny ones placed between the toes. The high iron content in basalt helps the stones retain heat during the massage. Hot stone massages are beneficial on both physical and psychological levels. The stones are heated and kept warm in a digital pot heater, in water or steam and placed on specific points around the body, usually on areas of dense muscle tissue such as the shoulders and back, or placed along meridian points in order to help reduce energy blockages that might encourage the development of disease, illness, or be placed to treat organs or muscular tissue, or be placed for chakra balancing. Heat from the stones also has the benefit of geomagnetism from the Earth source; which has a balancing and healing effect on body systems. 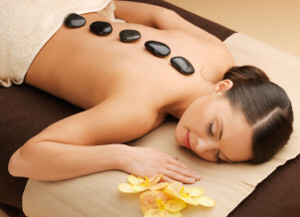 HOW DOES HOT STONE THERAPY MASSAGE WORK ? A hot stone therapy massage combines thermotherapy with different appropriate massage movements and techniques to provide an effective healing therapy. A hot stones massage uses the same techniques as a Swedish body massage but hot, volcanic stones are also used to warm tight muscles. The heat from the stones penetrates deep into the muscles and help to diffuse and relieve muscle tension much faster, and this makes it easier for deep tissue manipulation. Combining this with deep tissue movements, hand strokes and other forms of massage techniques, creates a powerful detoxifying and invigorating treatment. The heat from the hot stones help to expand blood vessels, which in turn encourages blood flow throughout the body. The hot stones have a sedative effect that can help to relieve chronic pain, reduce stress, promote deep relaxation and encourage the body to detox and heal. This also help to increase lymph flow and helps to flush out waste. Cancer, chemotherapy or radiations treatments; Immuno- Compromised or Depressed immune system- lupus, HIV/AIDS, Epstein Barr, mononucleosis; Taking medications that have side effects to heat – You are strongly advised to check with your GP or pharmacist if you are not sure before. High Blood Pressure – It is advisable for people with high blood pressure Not to have hot stone massage. Blood pressure rises when temperature rises. So, hot stone massage can indeed be detrimental to hypertensive people. Relaxation and Healing– The use of natural stones in conjunction with hand strokes massage techniques uses powerful earth energies to help the body heal. The benefits of hot stone therapy massage include the intense feeling of relaxation, as well as both medicinal and subtle energy upliftment benefits. The localized placement of heat on a particular area increases circulation of fluids, and can assist in alleviating organ congestion and may even dissolve masses. Quick and easier recovery and rehabilitation:- Hot stone massage can facilitate easy recovery from injuries such as sprains. Stress– Studies show that stress is the number one root of a lot of diseases and disorders. A hot stone massage offers some relaxing time for ther mind and does wonders in releasing muscular tension. This is one of the best ways to relieve of stress. Insomnia – Allows better sleep. It’s really hard to get a good quality sleep when you’re over fatigued. With the relaxation you get from this therapy, it makes it easier for you to doze off into a deep sleep which your body needs to recuperate from daily fatigue. This is why people who have Insomnia are often advised to get this therapy. Helps with release of Toxins: – Releases toxins from your body. When muscles are massaged, toxins that are clogged within are released. This is why, it’s advised that clients drink plenty of water after a session to help flush out those unhealthy and unwanted toxins. Mental Benefits:– Hot Stone Massage therapy can result in mental benefits as well as physical ones in some people. A hot stone massage may also help you combat some of the symptoms of anxiety disorders and depression. It is advised that hot stone massage therapy is not a substitute for traditional medical or psychiatric care, however, it can be an integral part of the treatment plan. Emotional Boost, Calming & Soothing: – hot stone massage encourages a happy feeling of wellbeing. A calming and soothing massage can do wonders in giving an individual an emotional boost, leaving you with a happier and more positive holistic and wholesome outlook in life, as well as the “FEEL GOOD” factor. The hot stone therapy massage helps you feel calm, deeply relaxed, blissed-out nurtured, pampered and very special. Go on, make a booking with us at Bliss Fountain and indulge yourself…because you are worth it ! !